Thanks to Crazy. Sweat. 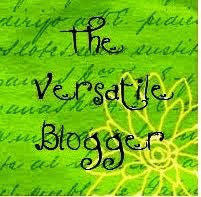 Mommy for nominating me for The Versatile Blogger award! I’ve been blogging for a decade (Livejournal, Blogger, WordPress, and then my own hosted site) mostly about different topics than I’m tackling here. I nuked my most recent blog a few months ago and destroyed those 10 years of blogposts that I had been dragging with me every time I hopped to a new format. It feels very freeing to be starting fresh! Display the award on my blog. Announce the win with a post and link it back to your nominator as a “thank you”. Present 15 awards to those of your choosing. Alert your nominees of their award status. I am adopted and so is my husband. The first person that either of us met who was blood-related to us is our son William. I used to have a piece of raw uranium in my bedroom as a kid. My dad was in the nuclear industry – and I love rocks and minerals – so it held a place of honor on my curio shelf. I love reality TV – Inkmasters and Master Chef are my current loves. The Real World San Francisco and Seattle will always hold special places in my heart. I was a very sickly child – major breathing issues – asthma, chronic pneumonia and bronchitis. We lived in Louisiana during my grade school years. We moved to Eastern Washington when I was in junior high and I became a track and cross-country runner and went to state all four years in high school. Climate can make a huge difference in your health! I currently work full-time and go to school full-time. Throw in Crossfit, volunteering, kids’ activities, and my husband’s constantly changing work schedule and you have some serious crazy. My husband says my schedule scares him. I love Louisiana, even though it makes me sick! I lived in the New Orleans area two years before Katrina. Two years ago I went back to New Orleans on mission trip and helped rebuild a church that had been flooded. That experience helped me rededicate myself to take on as many volunteering opportunities as possible. Pay it forward, people! I’ve lived all over the place. As an adult I’ve lived in Seattle, Dallas, New Orleans, Dayton, Albuquerque, and Huntington, WV. An no, I’m not in the military. I just take every opportunity that comes my way to experience new things. I’m supposed to nominate 15 other bloggers for this award. As I’m just getting back to blogging, and don’t have much time to read others blogs I’m just going to borrow Crazy. Sweaty. Mommy.‘s list. There’s a lot of great stories and inspiration in the above list. Check them out!